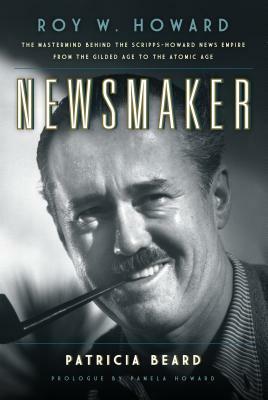 In the first half of the 20th century, the golden age of newspapers, the colorful, charismatic, and controversial Roy W. Howard reigned as the most famous publisher, editor and journalist of his time. Named one of "The 29 Men Who 'Rule' America'" on the front page of the New York Times, Howard built the United Press; was chairman of Scripps-Howard, one of the two biggest newspaper empires in the United States; and was president and editor of the New York World-Telegram. The first global news entrepreneur, he was a model for journalism in the digital age. Howard traveled 2.5 million miles to land unique scoops, and was the privileged confidante of every US president from Woodrow Wilson to Dwight D. Eisenhower. He met privately and conducted one-on-one interviews with President Franklin D. Roosevelt, Stalin, Hitler, Churchill, and the Emperor of Japan, and advised the most renowned figures of his time, among them a muddled Duke of Windsor, a grieving Charles Lindberg, and a desperate Chang Kai-shek. Based on fifty years of Roy Howard's privately held diaries, and thousands of pages of his "Strictly Confidential" memoranda, Newsmaker's author Patricia Beard takes the reader behind the scenes of a turbulent era, and provides background to the role of journalism in the digital age.